Heed my words: Even in gloomy Germany, summer is coming and with it the constant sunscreen struggle. (Although, as many of you know, the struggle is real for the most of us at any time of the year.) Just today I went to my local drugstore to have a look at the sunscreen options (maybe something changed from he last time I lived in Germany..?) but nope. the choices were all still absolutely terrible: No real sunscreen suitable for the face, high amounts of alcohol and a white, thick and chalky texture. Ugh. It can't be that hard, can it? 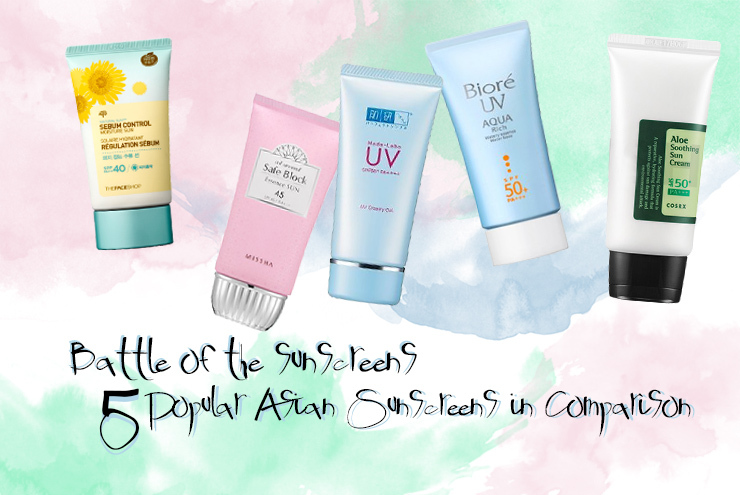 In the quest of finding THE ONE, I tested 3 popular Asian sunscreens and 2 not so popular ones. Wanna know which one has sunscreen majesty potential? 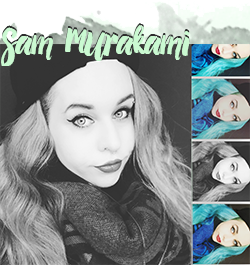 Make sure to read on! Around 80% of visible aging signs like wrinkles, age spots, pigmentation and so on are caused by UV damage, aka the happy little sunny ball that shines on us everyday. The most effective anti-aging treatment/precaution is to use sunscreen as a daily necessity. (Not to speak of preventing skin cancer!) This includes wearing sunscreen year round even though it is not summer (or even sunny!). If you check the UV index of where you live, you might be surprised how high the UV index can be even though it is a glooming rainy day outside. Using sunscreen is vital, but using the correct amount is even more important. If one considers how sunscreen is tested (2.0mg/cm² of sunscreen applied to a device used to measure the efficacy of sunscreen) and equates this to an average sized face, you will end up with ¼ teaspoon of sunscreen necessary for your face to get the labelled SPF protection. For UVA protection, look for Zinc Oxide, Avobenzone, Tinosorb S, Tinosorb M, Mexoryl SX, Mexoryl XL, Helioplex, Uvasorb HEB, Uvinul A plus, Bisdisulizole Disodium, and Meradimate. 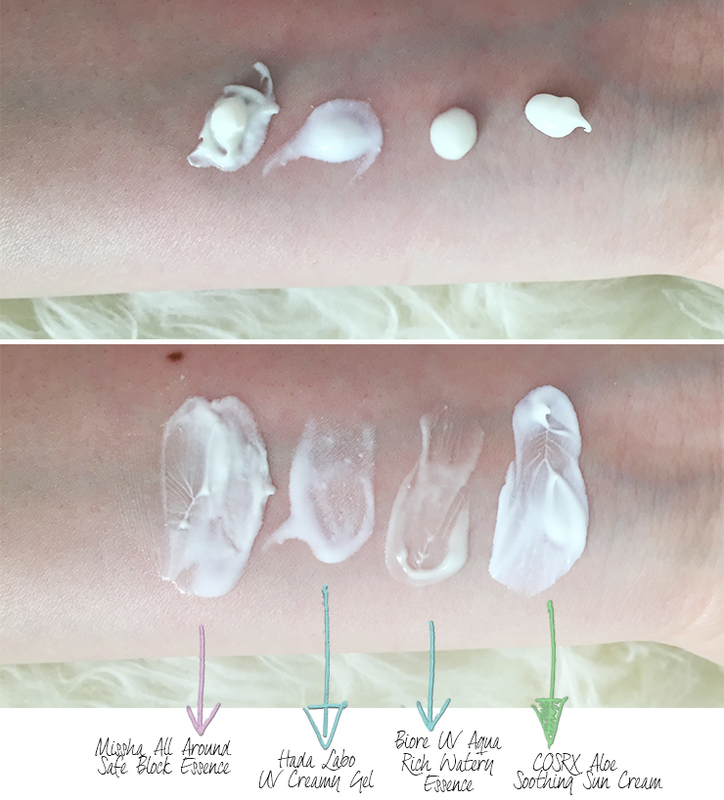 Since I cannot possibly cover everything important in this one post, please refer to vanityrex' amazing introduction Everything You Should Know About Sunscreen Part I and Part II for thorough guideline on this topic. Also, since I get lots of emails with questions about sunscreens with very utopical demands, let's face some realistic facts: A sunscreen that has a matte finish will contain alcohol, as it is exactly that makes it matte and fast-absorbing. A sunscreen with only physical filters will leave a white cast, as only Zinc and Titanium Dioxide are available as physical filters and both of them are white and quite thick in texture. The closest you get to waterproof sunscreens are the physical-only ones. Also, no sunscreen is truly waterproof, you will always need to reapply after you come out of the water. So, if you want to have a fast-absorbing, matte sunscreen you will need to have at least some chemical filter in it - vice versa, if you need something as waterproof as it gets, the white cast leaving physical filters are your best bet. Unfortunately to my knowledge, we can't have everything in one. 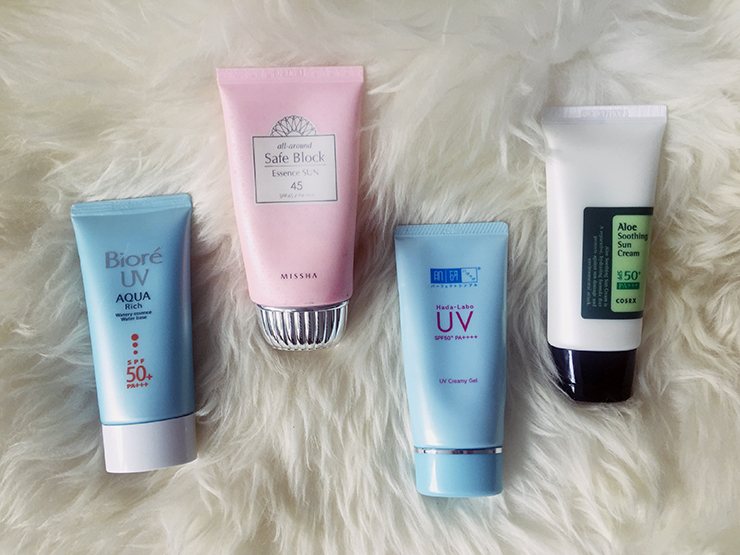 In contrast to my Western sunscreen options, these are all incredibly easy to wear, even under make-up. However, even between these there are fine differences; Hada Labo UV Creamy Gel is by far the most watery/fluid texture, it almost ran down my arm multiple times before I was able to make this shot. Second in terms of watery texture is the Bioré UV Essence which is just a tad thicker than Hada Labo. Both, Missha and COSRX are more on the thicker side but still spread very well on the skin. The Face Shop No Sebum Moisture Sun falls somewhere between Bioré and Missha and had the consistency of a light moisturizer but was a bit easier to spread than Missha in the pink tube - see swatch here. Texture: Thicker than the Bioré UV Aqua Rich Watery Essence but easier to spread than the Missha All-Around Safe Block Essence. Ingredients: Water, Cyclopentasiloxane, Ethylhexyl Methoxycinnamate (UVB filter), Alcohol Denat., Isoamyl p-Methoxycinnamate (UVB filter), Ethylhexyl Salicylate, Phenylbenzimidazole Sulfonic Acid, Dipropylene Glycol, Butyl Methoxydibenzoylmethane (UVA filter), Polyglyceryl-6 Stearate, Ethylhexyl Methoxycrylene, Tromethamine, Vinyl Dimethicone, Methyl Methacrylate Crosspolymer, Panthenol, Polyglyceryl-3 Methylglucose Distearate, Potassium Cetyl Phosphate, Propanediol, Dimethicone, Cetearyl Olivate, Polyglyceryl-6 Behenate, Acrylates, Sorbitan Olivate, Sodium Hydroxide, Sodium Polyacrylate, Xanthan Gum, Caprylhydroxamic Acid, Trisodium EDTA, Helianthus Annuus (Sunflower) Sprout Extract, Cetearyl Alcohol, Glyceryl Stearate, Methyl PCA, Plankton Extract, Silica, Butylene Glycol, Sodium PCA, Salvia Hispanica Seed Extract, Gossypium Herbaceum (Cotton) Extract, Parfum. *Potential acne triggers/irritants marked in red. *UVA/UVB filters marked in blue. Experience: This was the very first Asian sunscreen I used and I really really liked it. I originally planned to buy a back-up but then I was too tempted to try out others. Would definitely repurchase though. It takes a bit to completely dry but when it does, the finish is as matte as a sunscreen could go (at least from my experience). The cream itself felt more like a light to medium moisturizer and spread evenly on the skin. Worked well under make-up. Sadly however, it is a sunscreen with purely chemical filters (My preference would be a mixture of chemical and physical). Get It At: Ibuybeauti for 13,15$, Jolse for 14,94$, Koreadepart 13,48$, Ebay and Amazon. Texture: Albeit not being thick per say. the texture is quite firm and less smooth than all the other 4 sunscreens I have tried. I find that it sometimes tugs a bit at the skin and is the "hardest" to spread and the least yielding out of the bunch. Finish: It dries quite matte, probably a 3 out of 10 on my personal shiny-scale and the second most matte out of the bunch. Ingredients: Water, Ethylhexyl Methoxycinnamate (UVB filter), Ethylhexyl Salicylate, Phenylbenzimidazole Sulfonic Acid, Butylene Glycol, Diethylamino Hydroxybenzoyl Hexyl Benzoate, Methyl Methacrylate Crosspolymer, C12-14 Alkyl Benzoate, Cetearyl Alcohol, Bis-Ethylhexyloxyphenol Methoxyphenyl Triazine(UVA filter), Glyceryl Stearate, Cetearyl Olivate, Limonia Acidissima Extract, Rosa Davurica Bud Extract, Chrysanthemum Indicum Flower Extract, Camellia Sinensis Leaf Extract, Artemisia Princeps Leaf Extract, Cinnamomum Cassia Bark Extract, Diospyros Kaki Leaf Extract, Morus Alba Fruit Extract, Pueraria Lobata Root Extract, Nelumbium Speciosum Flower Extract, Portulaca Oleracea Extract, Glycyrrhiza Glabra (Licorice) Root Extract, Hamamelis Virginiana (With Hazel) Extract, Morus Alba Root Extract, Cucumis Sativus (Cucumber) Fruit Extract, Aloe Barbadensis Leaf Juice, Sodium Hydroxide, PEG-100 Stearate, Dimethicone, BHT, Panthenol, Polyisobutene, Polysorbate 20, Polyacrylate-13, Sorbitan Isostearate, Sorbitan Olivate, Sorbitan Stearate, Disodium EDTA, Caprylyl Glycol, 1,2-Hexanediol, Ethylhexylglycerin, Parfum. Texture: This is the most watery sunscreen I hands-down ever used and it's also what I really like about it. It sinks in fast and doesn't really feel like you have much on your skin which is a big plus for me. Finish: Despite it's very thin consistency, this sunscreen leaves behind a very noticeable shine on the skin. Experience: Let me give it to you straight: This has been so far my favorite sunscreen out of the bunch. It is by no means perfect, but I prefer using this over all other four I've tried. The consistency is very very thin and it absorbs quickly and it doesn't contain fragrance. Also, it is a mixture of both chemical and physical UV filters (explanation as to why this is important at the end of this post). I usually use two generous layers slathered all over my face. The only downside with this is that it leaves a very visible "greasy" shine. If I use this sunscreen, it will be under make-up anyways (because of its thin consistency) so I don't mind the shine too much as I'll cover it anyways - you can use a bit of powder though to control the greasiness a bit (and powder works great as a base for make-up too, so there you go!) I am super interested in other Hada Labo sunscreens though and I already have some on my way that will be entering part two of this post. Finish: Among all the sunscreens I tested, this is definitely the one that dries to a matte finish. Therefore, it is a really great sunscreen to be used under make-up as you don't need to worry about shine or greasiness. Ingredients: Water, Alcohol, Ethylhexyl Methoxycinnamate (UVB filter), Lauryl Methacrylate/Sodium Methacrylate Crosspolymer, Diethylamino Hydroxybenzoyl Hexyl Benzoate (UVA filter), Dimethicone, Acrylates/C10-30 Acrylate Crosspolymer, Glyceryl Stearate, Agar, Polyvinyl Alcohol, Sodium Hyaluronate, Citrus Grandis, Citrus Medica Limonum, Citrus Aurantium Dulcis, Xylitol, Butylene Glycol, Propylene Glycol, Sodium Hydroxide, Potassium Hydroxide, Phenoxyethanol, Disodium EDTA, BHT, Parfum. Experience: ....imagine my joy when this didn't break me out! I completely understand why this is HG for many people - if you are not sensitive to the ingredients (silicones/dimethicones can be a problem for some people) then this is a great everyday-in-the-office choice, especially if you are wearing as much make-up as I do. Plus it doesn't contain Stearic Acid which seems to be a major culprit for a lot of my readers as I get many tweets which products contain it and which don't. Imagine my sadness however, to see that this only contains one chemical UV filter. However, this was to be expected as the dream-like texture was too good to be true. I will use this up for less sunny days but because of the lack of broad protection, I won't recommend this as a daily option, especially in summer. Texture: This sunscreen leans towards the thicker end of sunscreens in terms of consistency. However, it does spread very well on the face and sinks in better than I originally anticipated. Finish: The finish is neither really greasy nor matte. My face doesn't turn into a shiny lightbulb but is not exactly matte either - it definitely leaves a feeling of "having something" on your skin which is one of the very few downsides for me - please also refer to the before and after pictures on my individual review of this sunscreen. Experience: This sunscreen is completely okay. And I mean that in a literal sense: It is not overly greasy, it doesn't break me out and I like using it. Compared to Hada Labo and Bioré though, this is not the sunscreen I would reach for if I had the choice. It is a decent everyday sunscreen though and I liked how it felt a tad more moisturizing than others. Get It At: Jolse 14,98$, Wishtrend 14,10$ (currently on sale for 12,69$), Ebay and Amazon. Note: I tried to mark all UV filters but some are hiding behind difficult long terms and cosdna and the like won't necessarily mark them as such. So if you see that I forgot to mark something, please let me know! Sunscreen pretty much should be considered a science of its own. Things to consider: Now, if you paid close attention to the ingredients list you may have noticed one thing: All those sunscreens have "Ethylhexyl Methoxycinnamate" as their main UV filter which means that they are all a mixture of mostly chemical and physical sunscreen filters at best and purely chemical at 'worst'. Please also not that all sunscreens that I introduced here are suitable for an everyday use for let's say, working in the office, shopping or going out for lunch. They are however not suitable for doing sports, going swimming or any other sweaty activity as they are not water-, sweat- or sebum-proof. The thing about this UV filter, that is also known under the name of Octinoxate, is that -like all chemical UV filters-, it generates free radicals in the skin which is a normal process of how these filters work and are a result of the break-down of UV from the sun. Although most formulas contain some antioxidant-ish ingredients to counteract this process, it certainly is something to think about when choosing your favorite sunscreen. A good compromise is to look for sunscreens that contain both chemical and mineral filters so that the chemical sunscreen has to break down a smaller amount of UV and the creation of free radicals is minimized. Update II: Upon further research, Ethylhexyl Methoxycinnamte is said to be an UV filter that works as a hormonal active substance. This means, this UV filter can work like hormones do in your body and that generally isn't a thing that I am a big fan of. Basically, cosmetics producers use endocrine disrupting chemicals (EDC) for their abilities to disinfect and kill microbes as preservatives (for example, methylparaben) or as UV protection (for example, octyl-methoxycinnamate, OMC). EDCs in cosmetics are legal and generally thought of as harmless, as long as certain limits are observed. However, EDCs have recently been linked to a number of health problems, including decreased sperm quality and fertility as well as breast and prostate cancer. These risks arise on the one hand through frequent use and on the other hand through the combination of multiple products and therefore a harmful mixture of said substances.